They may have lost the Series—but the MLB is sending Phillies World Series championship gear overseas for needy children. Above: Armando Velazquez. Photo courtesy of Salt & Ash. 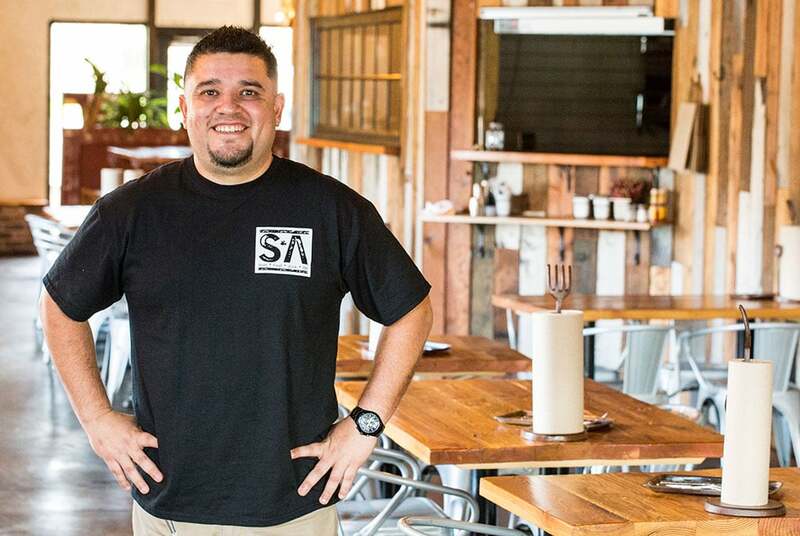 The owner of Placentia’s much-lauded Salt & Ash is moving into the Long Beach market by opening up a gourmet taco joint at the southeast corner of 1st and Linden in DTLB. Dubbed the Long Beach Taco Company, Armando Velazquez is shifting away from bone marrow and French toast—yup, that’s the kinda grub you’ll find at Salt & Ash—and instead opt for tacos, from the traditional to the experimental. Not only is Velazquez and Storts wanting their kitchen staff to have a chance at creating main menu items, they want people to understand that Mexican food should not be dictated by cheapness or accessibility. “Like all cuisines, the food of Mexico is rich and worthy of attention outside of what everyone thinks it is,” Velazquez said. As to what the twist on tacos is, we’re uncertain because he is leaving that up to his chefs, sous chefs, and kitchen staff. He noted it could be “experimenting with different types of tortillas” or it could be different meats. Padre up the street at Broadway serves fried chicken tacos while Pier 76 down the street at Pine serves smoked fish tacos (that are some of the most spectacular in the world—no joke)—but it is unlikely that Velazquez will go down either of those roads. “We’ll be pushing boundaries on the flipside of the menu,” he said. When it comes to the traditional side, Velazquez will have little competition given the lack of high quality Mexican food in DTLB minus two obstacles: Las Delicias de Michoacan, home to quite arguably the best carne asada tacos in the city, and the original Los Compadres at 12th and Pine. And while Leo’s Mexican Grill isn’t the most spectacular place on the planet, they serve up some Taco Tuesday realness that has a giant line (and, FYI, their crispy chicken taco is legit). Even better? Velazquez is gonna have twenty taps dedicated to local beers—with a handful dedicated to Mexico’s growing craft beer scene and will also be serving the anticipated Sublime beer set to be released in June. Either way, we’re just happy there are more tacos.